The Eighteenth Judicial District Commission on Judicial Performance unanimously recommends that Judge Charles M. Pratt BE RETAINED. 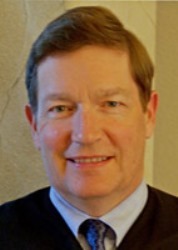 Judge Pratt holds an undergraduate degree in Economics from Colorado State University, and an MBA and law degree (earned simultaneously in 1982) from the University of Denver. For a number of years he worked in private practice, specializing in civil law. He was appointed to the Arapahoe County District Court bench in August of 2005 and currently has an 80% civil and 19% criminal docket. Judge Pratt is the Presiding Civil Court Judge. He has a long history of conducting volunteer work in the community, including judging mock trial competitions with high school and elementary-aged children. He is a member of the Access to Justice Committee, which works to find ways to improve the public’s ability to interact with the courts, has been a member of the 18th Judicial District’s Community Corrections Board since 2007, is active with the Minoro Yasui Inn of Court, mentors law students, and is a sought-after speaker at numerous legal education meetings, conferences and symposiums. Judge Pratt is seen by all categories of people providing input to the Commission (including attorneys, district attorneys, public defenders, non-attorneys, witnesses, litigants and defendants) as an outstanding judge who has grown and improved on the bench over the last six years. The Commission wholeheartedly recommends Judge Pratt for retention.